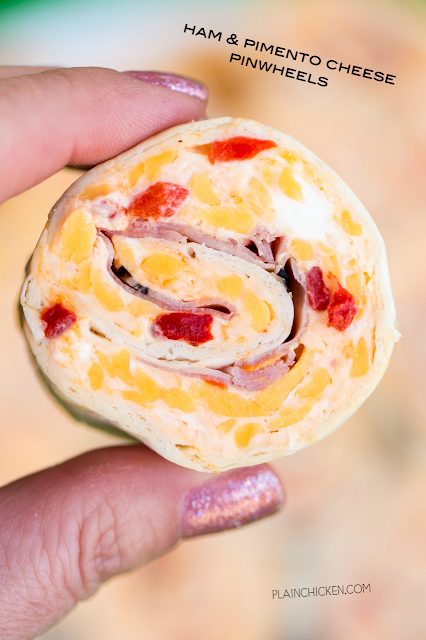 Ham & Pimento Cheese Pinwheels - I am ADDICTED to these sandwiches! Cream cheese, cheddar, parmesan cheese, garlic salt, pimentos, mayonnaise and ham wrapped in a tortilla. Can make ahead of time and refrigerate until ready to eat. Perfect for parties and tailgating!! A MUST for watching The Masters! It's Masters week! That means that our television will be on golf the entire week. We've had the opportunity to go to the Masters in the past. It is an amazing experience if you are a golf fan. Unfortunately, we didn't get tickets for this years tournament, thus we have to watch it online and on TV this year. One of the unique experiences in Augusta is the food. The prices are crazy cheap and the sandwiches taste great. Egg Salad and Pimento Cheese Sandwiches are the tried and true classics. I have copycat versions of each on the blog - HERE & HERE. I am really into the tortilla pinwheel sandwiches lately, so I decided to take my Masters Pimento Cheese recipe and modify it into a tortilla pinwheel recipe. I used large burrito size tortillas for these Ham & Pimento Cheese Pinwheels. You can really use any size you wish. The pinwheels will be just fine. You can also use regular flour tortillas or whole-wheat tortillas. I've even made these with the low-carb tortillas and they are great. As I said, I modified my Masters Pimento Cheese recipe for the filling in these tortilla pinwheels. I took my recipe and added cream cheese. You want the cream cheese to be at room temperature so it is easy to spread on top of the tortillas. To assemble the pinwheels, spread some of the pimento cheese on top of the tortillas and top with some thinly sliced deli ham. Roll up the tortilla tightly. Repeat this with all of the tortillas. Once the tortillas are rolled, I like to refrigerate them for about 30 minutes to let the cream cheese mixture firm up. It makes it easier to slice if the filling isn't mushy. I use a serrated knife to slice the tortillas into pinwheels. Make the pinwheels as thick or thin as you wish. What Goes with Tortilla Pinwheels? We love to eat these Ham & Pimento Cheese Pinwheels for lunch with some chips. Some other side dish options are: Sweet Macaroni Salad, Broccoli Pineapple Salad, and Crunchy Romaine Toss. 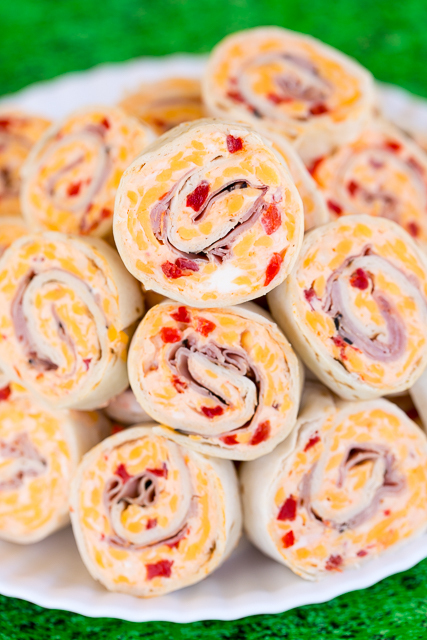 These Ham & Pimento Cheese Pinwheels are great for parties. You can make these a day in advance and slice them right before serving. Mix cream cheese with the cheddar cheese, parmesan cheese, pimentos, garlic salt and mayonnaise. Spread about 3 to 4 Tbsp of this mixture evenly on each tortilla then lay 3-4 slices of ham flat on top of the cheese mixture to cover in a single layer. I love your tortilla roll-up apps! I've made a few of them, and now I've got to try this one! Looks and sounds so delicious! I looooove pimento cheese!